The concept of the slow motion dunks option is rather straightforward. 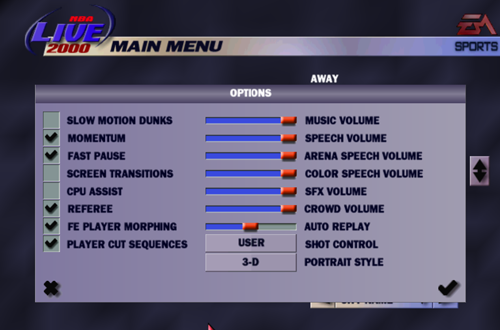 In the early days of the NBA Live series, there was a setting under the options menu where you could toggle slow motion dunks on or off. This isn’t referring to instant replay, but a real-time gameplay mechanic. When enabled, the game would slow down whenever a player began a dunk attempt. This was chiefly so that we could enjoy the dunks, and in those early sim-oriented five-on-five games, players with higher dunking ratings could perform some truly spectacular slams. Primitive as the animations may seem now, those 360s, double-pumps, and windmills felt awesome in slow motion. Of course, going into slow motion offered a couple of advantages beyond enjoying the game’s aesthetics and the feeling of throwing it down with authority. The other players didn’t stop moving just because a player had slowed down time with their dunk attempt. Teammates and defenders alike continued to react to the action, and the user was still in control. Slow motion dunks could therefore be a great advantage on defense, either when playing multiplayer or when the CPU was rising up for a dunk. There was a bigger window to time a block, or position your player for the board on a blown jam, before gameplay returned to normal speed. On the other side of the ball, you could see defenders bearing down on you and guess that they were about to reject your dunk. Therefore, an offensive player also had a bigger window to react to the play, and pass out of a dunk attempt. It may sound a bit cheap, and it certainly wasn’t very sim, but the mechanic did even out with both the offense and defense being given additional time to react. As far as I know, it doesn’t have any effect on CPU-controlled defenders and their ability to anticipate (or indeed, flat out button read) moves, and then time their blocks and rebounds accordingly. It does arguably give the user an extra trick to use against the AI, though. With that in mind, slow motion dunks was probably an option that you’d want to turn off if you were after the most realistic experience that those early games would allow. It could also get very cheesy in multiplayer games; although the point of slow motion dunks was to enjoy watching the players throwing it down, the purpose was defeated if it was too easy to anticipate and block dunk attempts. The double-pump dunks in particular were a lot easier to swat in slow motion, and they were trigged quite often. As cool as the effect was, it could also get in the way of gameplay, slowing down the action and arguably making dunks less effective than they should be. As such, the option would eventually be phased out. However, it remained in NBA Live for a lot longer than I originally remembered. As the years have gone by and I’m further removed from the days of playing those old games regularly, I’ve come to think of slow motion dunks as an option that was only available in the earliest titles in the NBA Live series. 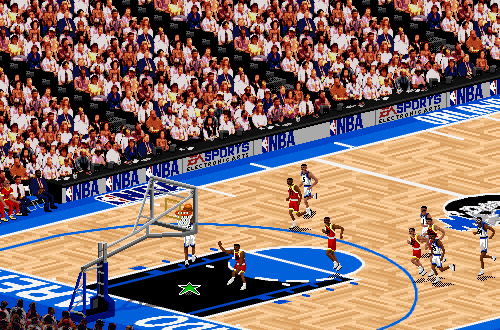 However, the setting did survive through to the early 3D era, remaining in the options through to NBA Live 2000. It wasn’t until I fired up a few games to double-check when the Isometric camera angle setting was discontinued that I was also reminded of how long the slow motion dunks option stuck around. By that point, I’d suggest that most of us preferred to play with the setting disabled. There was an increasing demand for basketball video games to be more and more realistic, and technology was moving towards a point where that goal was becoming more feasible. The fact that the game was rebuilt in NBA Live 2001 was probably a factor in its removal, too. Quite a few modes and features disappeared that year, such as in-game saves, practice mode, and the Three-Point Shootout. While losing them was definitely a blow for the series, a more antiquated feature such as slow motion dunks probably could afford to be left on the cutting room floor. Off the top of my head, I don’t recall any other basketball games of the same vintage that included a slow motion dunks option. 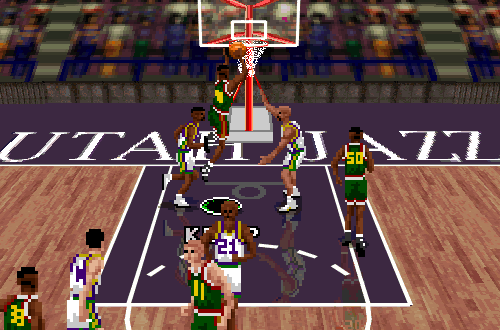 Although a lot of sim-oriented NBA games borrowed ideas from one another, it may be one that was unique to NBA Live. It certainly wasn’t particularly common, though once again, EA did keep it in the game from NBA Live 95 all the way through to NBA Live 2000. Although more than a couple of features have made their way back into later releases, slow motion dunks is an idea that has yet to be resurrected. All things considered, it’s probably for the best. It’s another feature that is very much a product of its era. 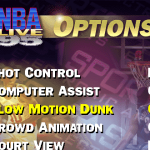 As is the case with most other outdated features and gameplay mechanics, I wouldn’t be completely against its return for the sake of adding nostalgic options to future NBA Live games. However, I’d suggest that it should only be available offline. Even with minimal lag, I could see it being an overpowering and frustrating mechanic in online play. It would also have to be a universal setting, since you wouldn’t be able to have some players with it enabled and others with it disabled, and there’s no way everyone would be able to agree on it. I definitely wouldn’t mind having it in the single player modes and local multiplayer though, and would likely use it every now and again. It’s probably not going to return anytime soon though, and that’s just fine. Again, it’s a product of its era, and outside of nostalgia, the mechanic doesn’t really have a place in modern basketball games. It certainly is nostalgic though, and thinking of it takes me back to a time when NBA titles were primitive, yes, but also a lot of fun. We dreamed of them one day becoming more realistic, but we also enjoyed them for what they were, and had no qualms about driving to the hoop to dunk as often as possible. Those slams – some outrageous, others more realistic – felt all the more epic when they were playing out in slow motion. You know what? Bring back slow motion dunks after all!